Robert graduated from the the University of Oklahoma (BBA) in December 1972. Upon graduation he began his insurance career as an underwriter for the United States Fidelity and Guaranty (USF&G) insurance company. He later worked for the Hanover Insurance and American General Insurance companies as marketing manager before joining the Howell-Stone Insurance agency in 1982. He joined Rich & Cartmill upon Howell-Stone Insurance merging with Rich & Cartmill in January 2018. 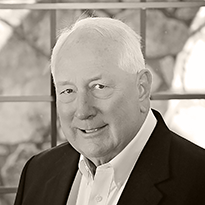 Robert has served on various insurance boards and panels including the Executive Board of Directors for the Independent Insurance Agents of Oklahoma, President of the IIAA of Greater Oklahoma City and several insurance committees and advisory panels for insurance companies that specialize in Construction related accounts. He and his wife, Cheryl, have been married since 1973 and have two sons, Kyle and Jay. Cheryl is a retired RN. They enjoy attending OU sporting events and family gatherings with their sons and families and their 5 grandchildren.